" A Public Option is the best... "
President Barack Obama guaranteed on Thursday that health care reform will be achieved, and he stuck by the public option as his preferred choice for revamping the insurance market. 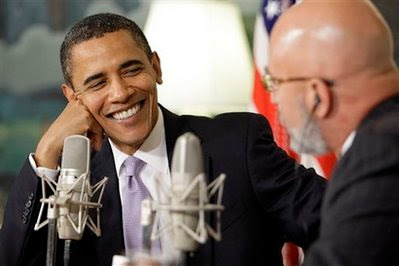 In an interview with Philadelphia-based radio talk show host and MSNBC analyst Michael Smerconish, Obama continued to talk about his desire to bring Republican lawmakers on board. He also chastised, ever so slightly, the press and progressives for getting "a little excited" in their suspicions that he was abandoning the public plan. "Our position hasn't changed," he said. Obama's most powerful moment, however, may have come when he addressed a caller who had supported his 2008 campaign but was concerned that the president's knees were "buckling" when it came to getting health care reform passed. 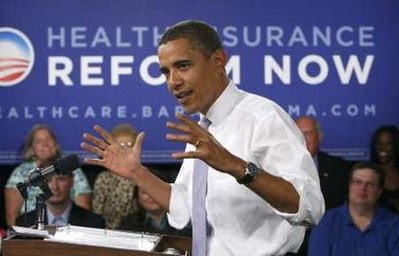 "I guarantee you," he told the caller, "we are going to get health care reform done. And I know that there are a lot of people out there who have been hand wringing and folks in the press are following every little twist and turn of the legislative process. You know, passing a big bill like this is always messy. FDR was called a socialist when he passed Social Security. JFK and Lyndon Johnson, they were both accused of a government takeover of health care, when they passed Medicare. This is the process we go through because understandably, the American people have a long tradition of being suspicious of government, until the government actually does something that helps them, and then they don't want anybody messing with whatever gets set up. And I'm confident we're going to get it done." Obama and his Democratic allies are making a renewed push to bolster public opinion behind his health care agenda. On Wednesday, Obama hosted a call with religious leaders who backed his proposal. Later on Thursday, he is hosting an open strategy session with his campaign arm - Organizing for America - to discuss the political landscape surrounding the health care debate. Through it all, he has stuck to a familiar script: health care reform needs to expand coverage, lower costs, and increase competition. A public option, Obama said on Thursday, is the best vehicle for achieving these goals. But no one should be "obligated to go into a public plan." On Thursday, Obama showed a certain amount of frustration with the GOP, but he did little to indicate he was willing to give up on recruiting bipartisan support. "As far as negotiations with Republicans, my attitude has always been, let's see if we can get this done with some consensus," he said. "I would love to have more Republicans engaged and involved in this process. I think, early on, a decision was made, by the Republican leadership that said, look, 'let's not give them a victory. Maybe we can have a replay of 1993, '94 when Clinton came in, he failed on health care and then we won in the midterm elections and we got the majority. And I think there are some folks who are taking a page out of that playbook." We're heading in a positive direction.